In the new report "Is Brown Green?" twelve public interest groups show how Governor Brown's environmental record is murky at best, despite his high-profile role attacking Trump's environmental policies. The cost to California ratepayers is at least $6 billion extra for the fossil fueled gas power they don't need. People who live near Also Canyon like Jane Fowler, who has been sickened by the largest methane leak in US history and Brown's rush to open the fossil fuel reserve, have paid a big price with their health. Fowler talked at the report's release about her stomach being enlarged and being sickened as gas withdrawal resumed at Aliso the other day. The toll goes far beyond the natural gas electric plant overbuild, which has enriched So Cal Gas, a subsidiary of SEMPRA, where Brown's sister sits on the board. In virtually every environmental indicator, but climate change, from coastal protection to oil drilling to water, Brown gets a bad grade for environmental policies. Governor Brown has recklessly encouraged oil drilling and fracking, while his counterpart in New York Andrew Cuomo banned fracking. He has allowed drilling in state waters, while calling on Obama to ban drilling in federal waters. Brown has refused to stop the use of oil waste water in irrigating our crops despite a petition from 350,000 Californians. Brown's office responded to the report on KNX radio that, "No jurisdiction in the Western Hemisphere is doing more to combat climate change with plans, among other things, to generate half of our electricity from renewables by 2030." Note to Gov Brown: environmental protection is more than combating climate change. When Toxics regulators poison communities and Brown turns the other way that's not being green. When oil waste water irrigates strawberry fields we all are at risk. When developers usurp our coast, California is diminished. 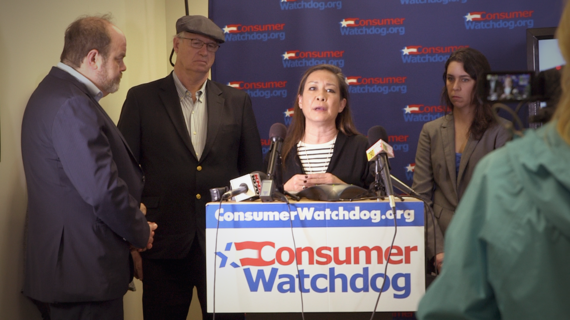 When Aliso canyon's natural gas reserve opens, the health of Porter Ranch residents is at risk. Brown needs to address the full spectrum of environmental problems that impact people daily, not just the long term devastation climate change can cause. His refusal to acknowledge his need to do more for people daily is a reminder of the dangers of the elite ivory tower Democratic approach that contributed to the transfer of power of the federal government to Donald Trump. If that doesn't wake Brown up, what will? 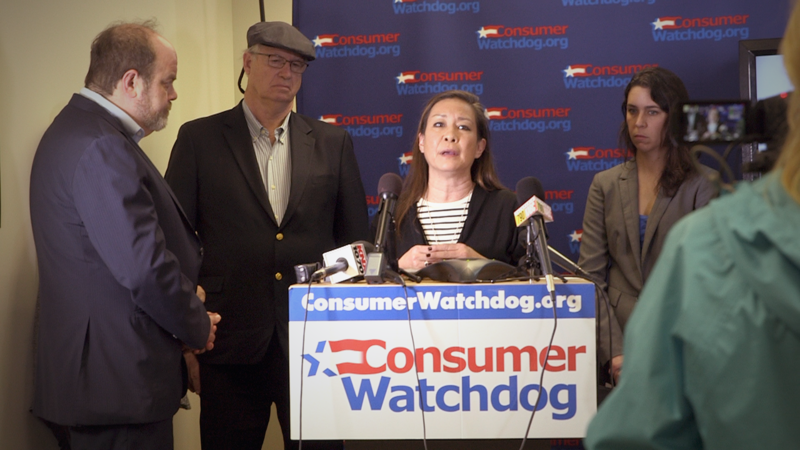 Consumer Watchdog's last report, "Brown's Dirty Hands," spurred an ongoing Fair Political Practices Commission investigation into the laundering of oil and gas company contributions through the Democratic Party to Brown. It charted the Governor's close political, financial and family ties to the energy industry. Many of the same people who allowed California to be ripped off during the phony shortages of the 2000 electricity crisis have come back to overcharge us for excess capacity. As Dirty Hands reports, many of them are still advising Brown. That's why increased solar power hasn't translated to fewer electric plants and no fossil fuel powered electricity. Brown's got less than two years left on his last term. It's time to not just focus on the future of the climate but the daily duty to protect the earth and its people.